Will Justice Rise With Al-Bashir's Fall? 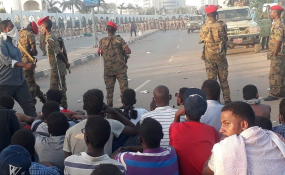 Soldiers stand in front of demonstrators in Khartoum on April 8, 2019. Cairo — Sudan's main protest organizers have called for the immediate handover of power to a civilian government in the wake of the military coup that ousted President Omar al-Bashir last week. On Sunday, the military council said it would name a civilian prime minister and Cabinet to help run the country but would not name a civilian to the office of the president. A military spokesman also said the council would not stop the demonstrations that are continuing. It remains to be seen if the announcement will satisfy the protesters who have demanded the council "immediately and unconditionally'' transfer power to a civilian government . The Sudanese Professionals Association, which has led calls for a civilian government, has urged more demonstrations until its demands are met. The demonstrations against longtime leader al-Bashir led to his removal by the military last week. The protests began December 19, with demonstrators accusing al-Bashir's government of economic mismanagement that has sparked skyrocketing food prices, and fuel and foreign currency shortages. Sudan's defense minister, Awad Mohamed Ahmed Ibn Auf, said a transitional military council will run the government for the next two years. The leader of that council, Lieutenant General Abdel-Fattah al-Burhan, said Saturday he is committed to transferring power to a civilian government within two years. He also ordered the release of all prisoners jailed under emergency laws ordered by the ousted president. Read the original article on VOA.